Thinking of buying a dog nail grinder? It is certainly a safe and easy way to trim dog’s nails which is popular with many dog owners. To help you get started, we have created a dog nail grinder reviews where we have included the 3 best dog nail grinders currently available on the market. Each grinder has its own specific features. These are detailed in the guide so that you will be able to find the grinder that is best for you and your dog. A dog nail grinder will work well on any size of dog, but it’s especially useful for dogs whose nails are too big and sturdy to be effectively trimmed with clippers or a guillotine trimmer. 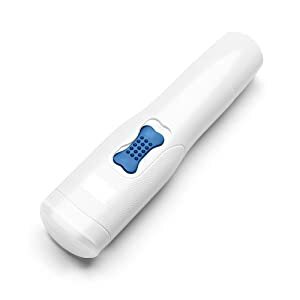 An electric dog nail grinder is equally a great solution if you are afraid of cutting into the quick. The grinding process is slower, more gradual, and allows you to stop before any damage is caused. It is also a better option for dogs that are sensitive to the pressure applied on the nail when using clippers or dog nail scissors. The pressure can cause discomfort or pain that is felt in the quick even if you are not actually cutting into it. In addition, the dog nail grinder is the only tool, other than a dog nail file, that you should consider using if your dog’s nails are brittle and split easily, or if your dog’s nails are already broken or otherwise damaged. The grinder will leave a perfectly smooth finish on your dogs nails. Some grinders come with a safety guard to help hold the nail in place. The safety guard is also especially useful for long-haired dogs as it will help keep their coat from accidentally getting caught in the grinder. Grinding, however, will not work on dew claws that have grown into a rounded shape as you will not be able to get in at a good angle with a grinder. At least not until you managed to trim them back into a half-circle shape with pliers style clippers. Grinding your dog’s nails will also take longer than cutting them, especially with large nails. Avoid lengthy sessions by frequent trimming and selecting a grinder with suitable torque and rotations per minute. The size and quality of your dogs nails will determine the trimming time, but count between 6 – 20 minutes for all the nails. 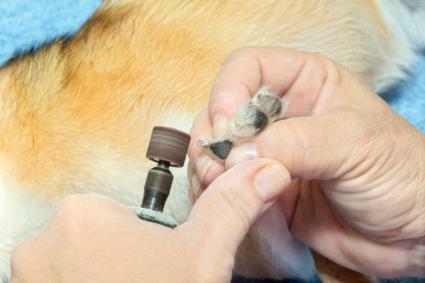 The nail dust produced by a dog nail grinder will make more of a mess than clippers do, so don’t wear your best clothes! However, if you opt for a grinder with a safety guard, the safety guard will collect most of the dust. With a battery powered dog nail grinder you need to make sure the battery is charged or that you have spare batteries. If you run out of battery power, you will have to wait until the battery is charged, or until you have bought new batteries, before you can continue trimming your dog’s nails. With a dog nail grinder you will need to take the time to let your dog get used to it. Many dogs will initially be wary of the sound and the vibrations. However, manufacturers usually give very good advice on how to desensitize your dog to the grinder. Before you decide which grinder to buy there are some important points to consider. Check the range of rotations per minute. For small dogs they don’t need to be as high as for larger dogs with thicker nails. Dremel recommends never using faster speeds than 15 000 rpm on nails of any size, but this will depend on the make of the grinder and the strength of its motor. The Oster corded grinder has a range of rpm’s from 0 to 20000. Check if the grinder has fixed speed settings or a sliding speed gauge. There are usually only two fixed speed settings, high and low. A sliding gauge will give extra flexibility. With a corded grinder you will never have to recharge or change the batteries. However, while some people prefer it, others find the lead to be a hindrance. Keep in mind that battery powered grinders are somewhat bulkier and heavier. Also if you run out of power, unless you can change the batteries, you will have to wait for the battery to recharge before you can continue. 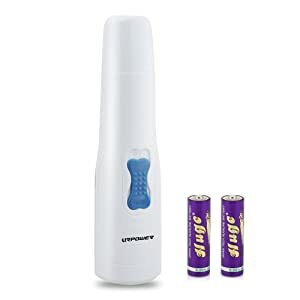 If purchasing a battery powered dog nail grinder, give some thought to what is most practical for you; a rechargeable battery or replaceable AA batteries. Consider whether you want it to have a safety guard. A safety guard not only stops hair – both your dog’s and yours – from getting trapped, but holds the nail in place and collects a lot of the dust nail grinding makes. Check the availability of replacement sanding drums, sanding bands and sanding stones. Sizes and grades may vary between different manufacturers. If you have decided to use a dog nail grinder to trim your dog’s nails, the first thing to do is to get your dog habituated to the grinder. 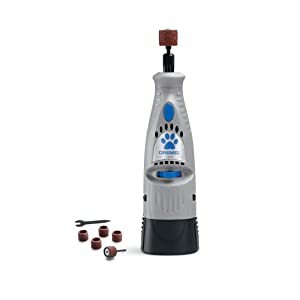 With most dogs this does not take long, but occasionally it may take as much as a couple of weeks before the dog is sufficiently desensitized to the noise and the vibrations the grinder makes. Only when your dog shows no fear or reluctance towards the switched on grinder should you attempt to start grinding the nails. If your dog has long-haired paws push the nails through gauze or an old sock to keep the hair out of the way. If you have a long-haired dog, you also need to pay attention to keep the coat away from the grinder so that it doesn’t get caught by the spinning part. However, if your grinder has a safety guard you don’t need to worry about this. Make sure your own hair is secured and consider whether you want to use eye and mouth protection. If you have a dog grooming table use it to help keep your dog in position. Using a dog grooming table will also be more comfortable for you. Ensure the grinder attachments – sanding drum and sanding bands, or sanding stone – are correctly assembled and secured onto the grinder. Decide on the speed to use. It will vary depending on the size and quality of your dog’s nails, the grade of sanding bands you use, or if you use a sanding stone. As a rule always start at the lower speed the first time. For small dog nails use low speed and experiment to find which grade of sanding bands work best. Higher speeds are only intended for larger dogs with big thick nails. Take a firm hold of both the toe and the nail to give them support. You need to steady both the nail and the toe against the vibrations. Be careful not to pinch. By squeezing gently you can make the nail extend a little more, making it more accessible. Turn on the grinder and start moving the sanding drum over the tip of the nail. Ensure that the spinning direction of the wheel is away from the dog, not towards him. If your grinder has a safety guard that covers the sanding drum, this involves selecting the right-sized hole in which to insert the nail before moving the drum over the nail tip. Don’t keep the grinder against the nail more than a couple of seconds at a time or the nail will get too hot and cause your dog discomfort. Progress by moving from nail to nail on one or two paws at a time, thereby allowing the nails to cool down in between. Don’t try to speed up the process by pushing down the grinder on the nail, it will make the nail heat up and may trigger the safety mechanism in the grinder and make it stop. This safety mechanism is meant to stop hair from being torn out if trapped in the grinder. On light nails you are able to see the pinkish outline of the quick. Stop when you are around 1/16˝ from it. On dark nails where the quick is not visible, stop when you see a darker dot on the grinded surface. That’s the beginning of the quick becoming visible as you get close to it. If your dog starts resisting you or showing other signs of discomfort, the nail may be getting too hot or you may be getting too close to the quick. When you completed the first two paws and if everything is going well, move on to the next pair. Lastly, don’t forget to show your dog how good he is by giving him plenty of praise and healthy treats both during and at the end of the grinding session. The more positive reinforcement you give your dog, the easier it will be next time. Different makes of grinders, such as Oster or Dremel, come with slightly different dog nail grinder attachments. These include sanding drums, sanding bands, and sanding stones. Before buying a dog nail grinder, make sure replacement parts are readily available at a reasonable price, see the Grinder Attachment Table below. Also, for your and your dog’s safety, use only attachments and replacement parts of the same make as your grinder. Before changing the attachment on an electric grinder, always unplug or remove the battery pack/batteries from the dog nail grinder. Read carefully the manufacturer’s instruction for changing the attachments. This is usually not complicated, but you need to know how to do it correctly so that they are securely fixed. Always replace chipped, damaged or worn out parts before using the grinder. The sanding drum, or mandrel, holds the sanding bands in place. Shaped like a drum, it has a screw located at the top that can be turned to make the drum expand and retract in order to secure or release the ring-shaped sanding band. Dremel sanding drums come in a choice of sizes. The smaller ones, measuring a ¼ “, are for small to medium sized dogs. The larger ones at ½” are intended for medium to large dogs. You will need to get sanding bands of the right size to fit the sanding drum. The sanding drum itself can be removed from the grinder in order to be changed or replaced by a new one or to insert a grinding stone attachment. Sanding bands come in different grits, or grades of coarseness. The lower the grit number, the coarser the grain on the sanding band. Grit numbers typically vary between 60 and 120 depending on the make. You will have to experiment with what works best for you, but generally high-grit sanding bands are better for small dog nails while a lower grit works better on large dog nails. It is important to ensure that the sanding bands are properly secured by sufficiently turning the screw on top of the sanding drum. Otherwise, they risk flying off when the grinder is turned on. The advantage of a sanding stone attachment is that it will last a long time. A sanding band when new may work more efficiently, but while sanding bands have to be changed, you will rarely if ever have to replace a sanding stone attachment. Depending on the manufacturer of the grinder you may be able to obtain sanding stones of different grades.